Click to enlarge and print the Flyer above (or see the larger one below). 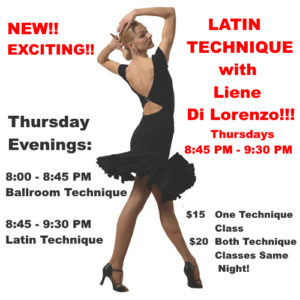 On Thursdays in May, from 8:45 PM – 9:30 PM, Liene Di Lorenzo will teach this EXCITING class on Latin Technique!! Don’t miss this Exciting Opportunity to learn high level Training & Technique for Latin Dancing from Liene Di Lorenzo – One of the World’s Best Dancers! And, then stay for the Supervised Practice Session & Q&A – open to all students who take any of the three Classes taught by Liene & Paolo on the same Thursday night!